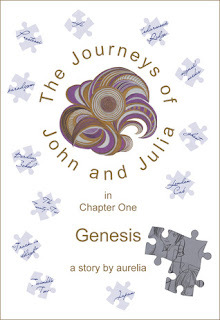 The Journeys of John and Julia begin. Reality is about to change. It all starts when Julia's parents totally mess with her summer. First Julia's dad takes off to start a whole new family. Then Julia's mom yanks Julia from cheerleader camp to spend the summer with her grandmother in the land of no signal, no mall, no best friend Kellie. Julia's only hope for human contact is geeky John Freeman, who is six months younger than she and about a million years behind her idea of cool. If only Julia knew that her mom plans to dump her at Grandma's not just for the summer, but for a whole year. If only Julia knew that a collective of wondrous being called The Twenty-Two are watching over her and trying to make contact. If only Julia knew that they could tell Julia every thought she never knew she had and bend her reality in any way they choose. And that she'd be with John Freeman when it happened. He'd think that was way cool. I honestly do not know where to begin with this novel and I do not know what, exactly, I was expecting when I requested it off of NetGalley. First of all I do not like science fiction nor do I like middle grade so if you are a fan of either or both then you may want to only take my review with a grain of salt. Going into this I did not know it was a middle grade. I thought it was a science fiction young adult and I decided to give it a try, because maybe I would like it because it sounded innocent and that maybe I would be able to relate somewhat to the whole girl dealing would issues and maybe it would turn into a little bit of a romance between her and John. I was completely wrong about all my assumptions. Since it is a middle grade the characters are ages 12 and 13 and I do not relate to twelve/thirteen year olds well lol. They are still in that im a kid, but not a little kid stage so their "issues" and "struggles" aren't issues or struggles to me. Also this novel was described to me as "if you liked the TV show Heroes you are sure to like this". Needless to say I hated Heroes, so again no idea what I was thinking. I really hated Julia's character, because she was a complete total brat. The way she talks to her mom is dumbfounding and I wanted to smack her across the mouth. I understand when in a YA a 17 year old will talk back to their parent, because usually it is when dealing with a big issue like a love interest, or college, or when they aren't being a parent at all, but when a 13 year old does it, because she can't go to cheerleading camp I am over it. When she tries to throw it back at her mom that the only reason she is booting her off to grandma's is because her mom is jealous that she has a life since she couldn't keep her father I am furious and want to stop reading. That whole scenario only happened in the beginning. Julia also treats her friends pretty crappy by saying rude things that she doesn't mean to hurt their feelings, but if they do it to her she goes nuts. With John I definitely liked him more since he was a sweet 12 year old. He liked reading in his tree house that he built with his dad and eating homemade cookies from his grandma, but he was too young and sweet for me to connect with and want to read a whole chapter book on his terrible cousin. The Twenty-Two gang interested me a little bit cause I wanted to know all their powers, but it still wasn't enough for me to want to keep reading to find out. On to a little bit more technical things. I understand that this is was put on NetGalley and that maybe it is considered an ARC, but it was released in September of last year so I am not sure if this is an ARC or the real deal. Either way the editing was terrible. Every single page I found either a typo, a grammatical error, or just sentences not making sense where I would try to re-read them over and over and try to decipher their hieroglyphic meanings, but could not. Lastly, I feel like there might have been some personal opinion of the author or their religion thrown into this novel a bit. I did only read till chapter nine, but it seemed like there was a lot of stigmatism about Julia's parents being divorced. It was an awful thing to all the characters in the book and even one of the Twenty-Two members thinks that if they just put her parents back together her life will be back to perfect. Also, Julia's friends mother had her when she was sixteen and there is a moment in the book where her friend shows shame for her mom being so young. I don't know if these topics were put in on purpose or it just happened that way, but I didn't like them. Thus, I had to put down the book. I do not do this often so it was definitely a feat for me. I just couldn't relate to the characters enough to want to tough it out and if you have no connection with the characters you are screwed. I couldn't bring myself to finish this novel. The Journeys of John and Julia just wasn't for me and I will not be continuing with the series. I couldn't connect with the characters in any way and felt like the actions of Julia were extreme and just wanted to hit her. The editing in this novel was terrible, there were a lot of sentences that just didn't make any sense. Lastly, there were some opinions on topics in this novel that I just didn't agree with such as divorce and teen pregnancy and so I was left with just putting down the book and not looking back. If you like (possibly conservative) middle grade science fiction then you might like this novel. If you liked the TV show the heroes and like middle grade novels you may also like this series. I unfortunately do not.